Pinaapple Pork Egg Rolls Made with ground pork, Thai chili peppers and fresh baby spinach may sound like an odd combination of flavors but it really isn’t. The combination of sweet from the pineapple, spicy from the peppers and freshness from the ginger makes for an unforgettable egg roll. 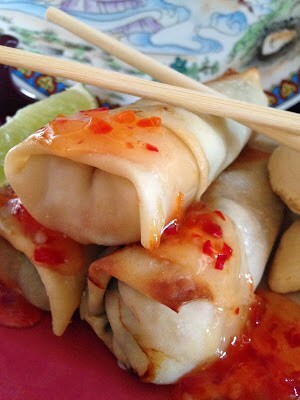 For this recipe we purchased a simple chili sweet and sour dipping sauce. Feel free to dip your egg rolls into your favorite bottled sauce or make your own. An easy dipping sauce can be made up of soy sauce, fresh ginger, chilies, green onions and sugar. I’ve found with Asian style cooking, the simplistic sauces are the best. Here is a list of four Chinese dishes that we’ve made most often here on T2T. Egg Roll: Egg Rolls are small, stuffed deep-fried Chinese pastries which are served as appetizers. 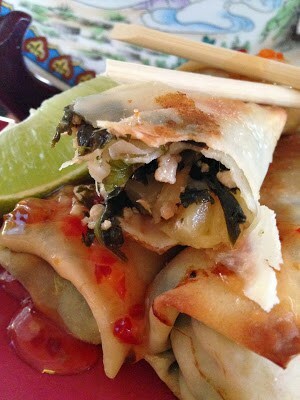 Paper-thin egg roll wrappers are folded around a savory filling of shredded vegetables and meat. Stir-Fry: This cooking technique is at the heart of Chinese Cuisine. Using a wok or skillet, ingredients are cooked by rapidly stirring and tossing then in hot oil over high heat for a short period of time. Wonton: These bite-size, deep-fried dumplings can be boiled or steamed. 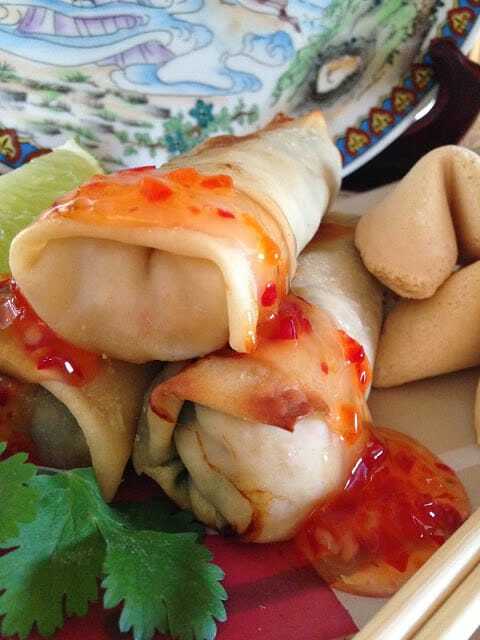 Paper-thin wonton skins are filled with a mixture of meat, seafood and/or vegetables. Cantonese: The city of Canton, now called Kwangchow, in southeastern  China just north of  Hong Kong. Gives its name to dishes of the region. Among them are sweet and sour dishes and stir fries. In a wok or large skillet, drizzle oil over high heat. Add the garlic and ginger. Fry just until fragrant, about 30 seconds. Stir in the pork and cook, stirring often, until pork is heated through. Stir in the chilies, cook for one minute, then add lime juice, fish sauce and sugar. Cook until most of the liquid has evaporated. Stir in the pineapple pieces and spinach. Cook until heated through and leaves begin to wilt, taste for seasoning. Remove from heat and let cool. Spoon 2 to 3 tablespoons of pork mixture on the bottom third of one egg roll wrapper, fold sides toward center, top with a few cilantro leaves, fold the sides of your egg roll wrapper over filling and roll tightly. Keep remaining wrappers covered with a damp paper towel until ready to use. Place seam side down on a baking sheet coated with cooking spray. Repeat with remaining ingredients. Spray tops of egg rolls with cooking spray. Bake at 425º for 10 to 15 minutes. Cool slightly. Serve with Chili Dipping Sauce. 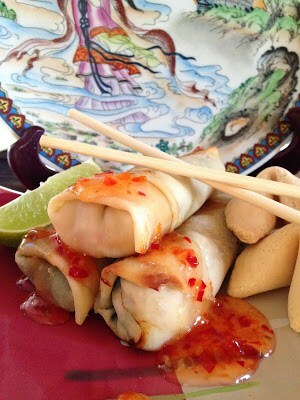 We thought you might like these Chinese inspired dishes also Pork Egg Rolls with Orange Sauce, Sweet n Sour Chicken and Shrimp Egg Rolls with Sweet Sour Sauce. Yum! I love the pineapple in these. It's such a bright flavor and perfect with pork! These sound awesome! I love the sweet & salty aspect with the pineapple… so yummy! That recipe is definitely a good I will be making them! Everybody loves discover delicious new recipes, and an occasion this is a perfect opportunity to do so. This looks delicious Lynn. I had been attempting deep fried spring rolls and they totally fell apart, so I'm going this route instead. The combination sounds delicious. I love that these are baked, not fried! They look so good. Thanks for sharing with the SRC. That has got to be the best new kind of spring roll flavor I have heard of, yummy! Spring rolls are always a hit with us! Love that they are baked and not fried..great SRC pick! Those sound so fantastic!! What a great pick for SRC!! Now I am craving me some spring rolls. yum, yum!! Happy Reveal Day! Good Morning Lynn, Your post is fortuitous, as I was talking to my daughter over the weekend and she is going to send me some thin Chinese wraps which she buys at her local Asian store. I have never had pork and pineapple before, it is an unusual combination of foods, but one which I am looking forward to trying. I like the fact the these spring rolls are baked and not fried. I can see this as a nice Saturday evening supper. I love pork and pineapple together, and you definitely caught my attention and made me crave these after I seen your pictures. They look great Lynn! I've always wanted to make baked egg rolls – these are a great excuse to try it out! Good pick. Pineapple + pork = perfect pairing!